CLOSE TO MY HEART BLOG HOP today! Woo-Hoo! Thanks for joining us in our Close To My Heart Blog Hop. We are a short hop with only 10 stops including this one, so be sure to hop over to all my talented friends' blogs, follow them (and be sure to follow me using BLOGLOVIN - button under my followers tab of my blog in the left column), leave them some comment love, and keep an eye out for BLOG CANDY! Ready to see my project I made for this hop? 4. If you would like a second entry go "Like" Craftin Desert Divas Facebook page. Leave a comment there and back here that you did. Good luck! Now here's the entire blog hop list! Enjoy the hop!! 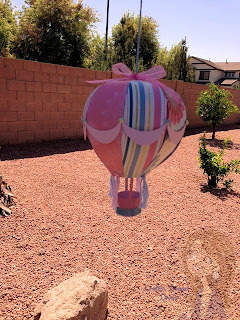 Wow, your hot air balloon is awesome Tara! I love the CTMH papers you choose, so pretty and reminds me of the summer. We used to see some hot air balloons every now and again, but the past few years we haven't seen any. I miss seeing them in the horizon. 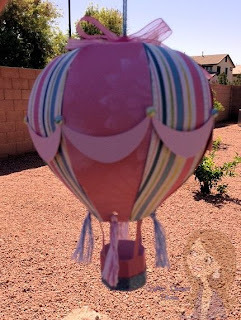 So thanks for sharing your "mini" hot air balloon!! Tara, this is absolutely adorable!!! Great project! Your blog is looking so pretty and summery. That hot air balloon is so cute/ Fun way to photograph it. What a adorable Hot Air Balloon. Love the colors and papers. Taking the pic outside what a great idea. Wow, that is just beautiful!! I love hot air balloons and this one is so pretty. Now neat and different. Great idea. Wow what an unbelievable creation a Hot Air Balloon how creative and clever are you gosh girl you talents are truly amazing. WOW!! Shut the front door-- yowza wowza! Love this so much! This is Seriously AMAZING!!Wow! !This is GORGEOUS!FUN!Love it! LOve,love,love that hot air balloon!!! Always like dropping in :). I really like your work! Nice job. Great job! I am a follower. Tara this is so pretty!! You did a wonderful job on it. The papers you used are perfect. Have a blessed weekend. Love your project, its so fun! Have a great weekend. Oops, forgot to put that i have a USA address. Wow, beautiful projects, thanks for sharing. I am following on bloglovin. but just to follow.. I am from Canada.. but wanted to tell you love your project.. Your project is so awesome. fantastic job on the Balloon, wow, I love it. Your hot air balloon is just amazing, Tara! What a creative lady you are, my friend! Loved hoppin' with you toady! Love your project! the colors are perfect! Love your balloon, great idea!! Wow Tara, what a fabulous project. Great job! !